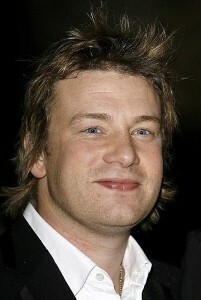 Celebrity chef Jamie Oliver and his wife, Jools, will welcome their fourth child late this summer. And, Oliver is joking about the surprise nature of the pregnancy, calling the unborn baby a "hangover child," but not for obvious reasons. Oliver explains to Times Online that Jools had taken the drug Clomid to stimulate ovulation in order to conceive daughter Petal, who’s now one. "Then Mr. O gets back in there again, thinking it’s not a worry. But whatever they’ve given her is still hanging over for 11 months," he told the news source. Although Oliver admits it was a surprise to learn the couple was expecting so soon after having a child, he says they already had made the same mistake before. It turns out the Olivers had struggled to conceive their first child, Poppy, now 8-years old, and turned to the drug for help as well. Baby number two, Daisy, now 7-years old, was conceived unintentionally because the medication was still in mom’s system. "We made the same mistake. And here we are. Just call it a hangover child," Oliver joked. Oliver is currently appearing in the ABC reality show "Jamie Oliver’s Food Revolution." The program takes place in the city dubbed by the U.S. Centers for Disease Control and Prevention as the nation’s unhealthiest, Huntington, West Virginia. In it, Oliver works to change the eating habits of the city’s residents.